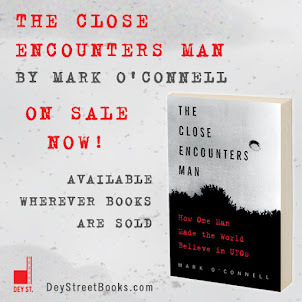 The Amazon reviews are coming in for my J. Allen Hynek bio The Close Encounters Man: How One Man Made the World Believe in UFOs, and they are solid. Eleven reviews so far, giving me an average of 4.6 out of 5 stars. Not bad. What's really interesting to me is the one fairly bad review so far. Bad reviews are instructional, and inevitable, so I'm grateful to this reviewer for sharing his opinions, and bracing me for what may be to come. This person gave me 3 stars, which is really not that bad, but had a long list of gripes. Sadly, in my opinion, he/she started out on the wrong foot by saying, "I do consider myself more informed than your average person in regards to UFO phenomena and/or extra terrestrial visitations," right after saying, "I had never heard of J Allen Hynek before." Now it's true that you can know a lot about UFOs and still have never heard of Hynek, but it's a little silly to say that you're "more informed than the average person" and then admit to that particular ignorance. That's an awfully big balloon. Naturally, there's a lot in the review I disagree with, but now and then I can see where the reviewer is coming from. There's one point, however, that is so baffling that I feel the need to address it here, because the reviewer seems to be accusing me of claiming that Dr. Hynek was involved in some kind of bizarre time travel experience. My book recounts how in the early 1960s Hynek developed a program called Star Gazer in which a high-powered telescope would be launched on a balloon from Holloman Air Force Base in southern New Mexico and taken 15.5 miles aloft to get pictures of stars outside the obscuring influence of the earth's atmosphere. As described in my book, the project failed for various reasons, but the concept ultimately paved the way for the Hubble Space Telescope. 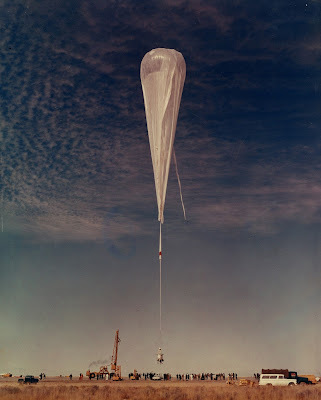 On one of the failed test flights, high winds tore the giant balloon from its tether and blew it away. 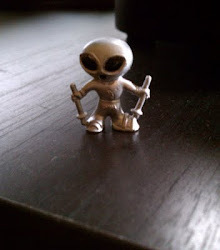 It traveled 100 or so miles to the east-northeast and finally came to earth outside Roswell. When it landed, the wind dragged the balloon along the ground, damaging it beyond repair. 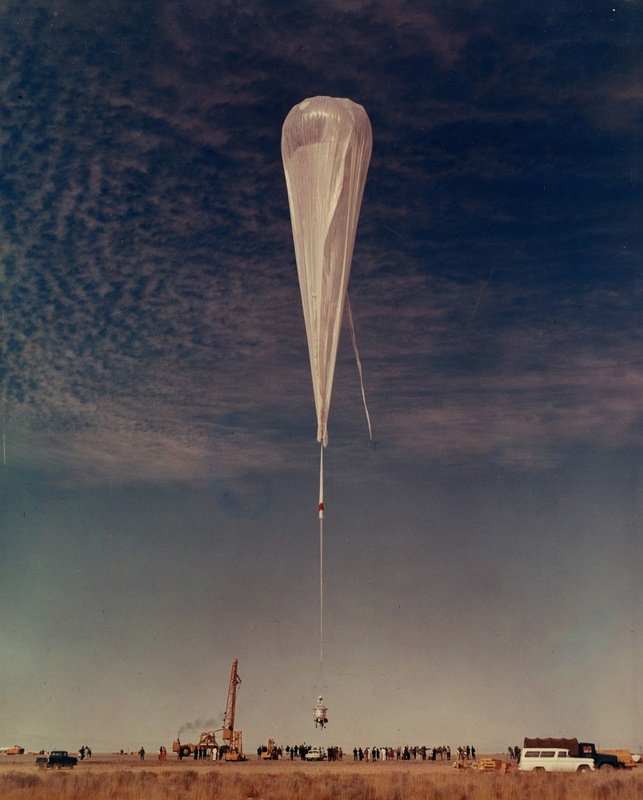 It's not too hard to read between the lines here: if a test balloon launched from Holloman AFB was carried by the prevailing winds to a spot outside Roswell in 1963, couldn't something very similar have happened 16 years earlier, in July, 1947? Now, I don't actually draw that conclusion in my book, because, as I just said, it's not too hard to read between the lines, and I trust my readers to interpret the evidence and draw their own conclusions (and, I think it's more fun for the reader to be able to engage with the book this way). At some point in the book the author hints at the whole Roswell affair as being not just a weather balloon like the Air Force finally concluded, BUT HYNEK'S OWN WEATHER BALLOON from his high altitude experiments. I mean, what!? The author says Hynek's weather balloon went up, got carried far away and ended up all torn and strewn about a Roswell ranch. He doesn't directly tie it together but the suggestion is that one of the biggest and most talked about events of all time on the topic of flying saucers, ET's, etc was just factually a freaking weather balloon designed and launched by Hynek. Conspicuously missing from all the pages in this book is anything Hynek had to say about Roswell. The man would have said something.. Either in the interest of the reporting of the event itself or in the way of confessing that it might have been his fault. There is zero mention of this except a tiny paragraph hinting that Hynek's lost balloon was the Roswell event. To me, I can't understand how Roswell was left out altogether. Did Hynek have an opinion? We don't know. Let me be clear: I do not claim in any way that Hynek's balloon was launched in 1963 but landed in 1947. That would make a great Twilight Zone episode, but in the real world it would be impossible. But, because of what happened with Hynek's project in 1963, we know for a fact that a test balloon launched from Holloman--in 1963, or 1947, or 2017, or any year you choose--can be carried by the wind 100 miles to the E-NE and can crash into a heap of debris near Roswell. We know it can happen, because we know it did happen. In 1963. P.S. Also, we do know Hynek's position on Roswell. It's right there, plain as day, on pp. 331-332 of my book. Okay, you've convinced me. I'm setting aside my thick, exhausting biography of Gladstone and starting CEM. As promised a review will be forthcoming...minus the time travel stuff since that has already been covered.